Antonio De Loera-Brust was born in Ithaca, New York and raised in Davis, California. The son of Mexican immigrants, Antonio was brought up to value both his Mexican heritage and American civic duty. In High School, Antonio began what would become 7 years of service to the local farmworker community, culminating with 4 years in charge of the after-school program at the Madison Migrant Center in Yolo County, CA. Antonio graduated from Loyola Marymount University in 2017 with degrees in Film and Television Production and Chicano Studies. At LMU, Antonio advocated for his fellow Latino students as a leader of MEChA and led service trips to Tijuana focused on the issues of poverty and migration. Antonio also reported in print and film on the refugee crisis in Greece and Germany and on the life of deportees in Tijuana, with a focus on deported US military veterans. In 2016, Antonio’s wrote and directed a narrative short about migrant farmworker children struggling to adapt to a new school. The film was exhibited at the short film corner at the 2017 Cannes film festival. Upon graduating, Antonio spent a year in New York City as a Joseph A. O’Hare S.J. fellow with America Magazine, a Jesuit-run national print magazine and online platform. There Antonio produced video content and wrote about sports, race, film, and politics in the United States and Latin America. 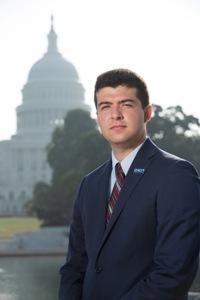 As a CHCI Public Policy Fellow, Antonio hopes to build connections with other young Latino leaders and learn how policy is made in issue areas such as agriculture, immigration, and foreign policy. Antonio sees it as his duty to do his utmost to ensure Latinos always have a seat at the table in our nation’s democracy. His career goal is to increase Latino political influence nationwide and back home in California.